Casino games sometimes have unwritten rules that beginners might not be aware of. It may seem strange, but etiquette is actually a very important part of many games that are available at casinos. A beginner could show up at a casino to play a game commit several faux pas without even realizing it. If you are brand new at a game such as Blackjack you could stick out really bad if you do not know what to do. There is nothing worse than becoming a nuisance to the other players at the table and getting the stink eye from everyone. So if you want to be a good and wanted player of Blackjack then you need to know the Blackjack table etiquette. Understand the Table Limits: If you do not know the table limits, then you are completely lost. Every table has a sign posted in a very visible manner what the minimum is and what the maximum is. If you are just starting out as a Blackjack player, probably the limit that is going to be of more importance is the minimum. It would be a real shame if you, as a beginner, sit down at a table with a $10 minimum and you bet $5. You are going to look like a complete loser who has no idea what he/she is doing. Just doing something like that shows that you are looking for a different table. Therefore, it is of utmost importance that you know the table limits. Know How to Buy Into the Game: Buying into a game is also something of great importance. You cannot simply show up flashing money. You absolutely DO NOT put a $100 bill in the middle of the betting square; you also simply DO NOT hand the dealer cash. What you CAN do is lay it on the table and ask the dealer to change you $100 bill; they will call for change gladly. The dealer will say “Change 100” and give you chips in different denominations so that you can begin playing. Know the Rules: Obviously, the rules of the game are extremely important for a player to know. The problem is that sometimes the rules are posted, sometimes they are not. But if they are not, that is no excuse for you not to know the rules. If a circumstance comes up where there is a move you’re not sure you can make, do not hesitate to ask the dealer; there is no problem with that. But DO make sure that if you asked once, that you DO NOT ask again. You have to know that you have been told once, and once is enough. Know the Signals: As in practically all the casino table games, there are signals for each and every move. You, of course, can say the move verbally, but the vast majority of the time players simply gesture to show what they are going to do. You must understand the signals that players use to make the various decisions, whether it is tapping on the table to mean hit, waving your hand to stand, putting another chip in front of your existing chip to double down, or putting another chip down alongside your existing chip to split. If the dealer is not sure of what you want to do, he will ask you. 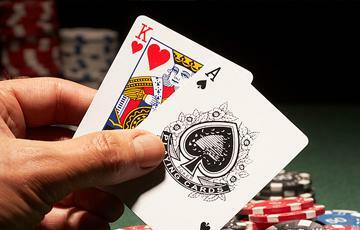 Don’t Touch the Cards: This is not true of regular blackjack or various variations of the game. But in face-up Blackjack, this is a huge no-no. You simply do not touch the cards. If you do, be certain that the dealer will tell you in very clear words to not touch them. Don’t Lose Your Temper: In gambling, or in anything else in life, honestly, you will encounter things that may not go your way. Do not get angry or yell or curse. It looks bad. Keep your emotions in check. It is, after all, just a game. Don’t Interfere With Other Players: This one is quite clear. DO NOT give other players advice or ask about their plays or anything. Its rude and, what do you know anyway? That is how it will be seen. Tip the Waitresses: If you order a drink, don’t forget to tip the waitress when she comes with it. It’s common courtesy. So take these tips to heart. Believe it or not, Blackjack table etiquette will make you a better a Blackjack player.